Obama, Castro Share Awkward Handshake In Cuba After Historic Meeting : The Two-Way What began as a regular handshake after a historic meeting between the leaders went awry as the Cuban leader raised Obama's limp arm above his head. It was awkward. Cuban President Raul Castro tries to lift up the arm of President Obama at the conclusion of their joint news conference in Havana, Cuba, on Monday. In the moments after the end of a historic press conference held by President Obama and President Castro in Havana, Cuba, what began as a regular handshake morphed into ... something else. 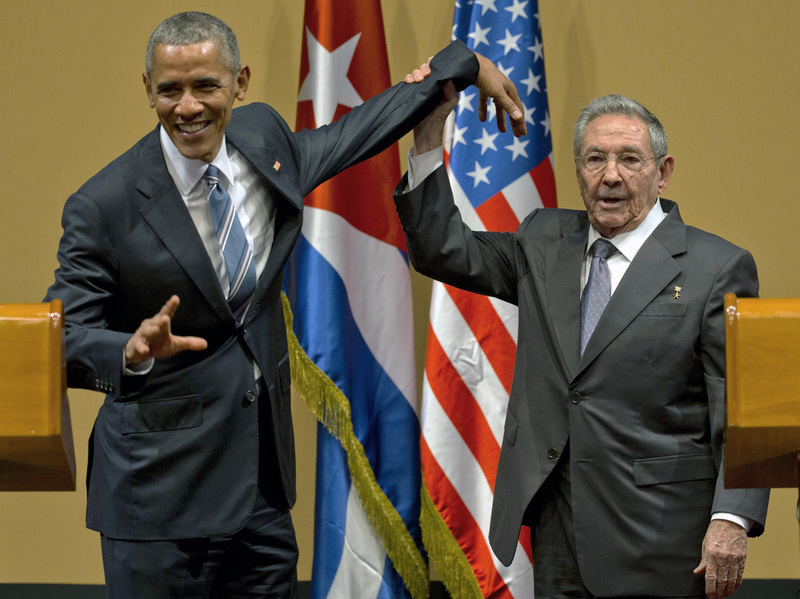 The Cuban leader raised Obama's limp arm above his head and held it there for a few seconds. The move most closely resembled a wrestling referee announcing the winner of a wrestling match. Only way more awkward. Castro grabs Obama's limp wrist, hoists his hand into the air like the winner of a prize fight. Most awkward POTUS scene I can ever recall.